Theresa May has just written to the European Union asking for a longer Brexit extension until 30th June. 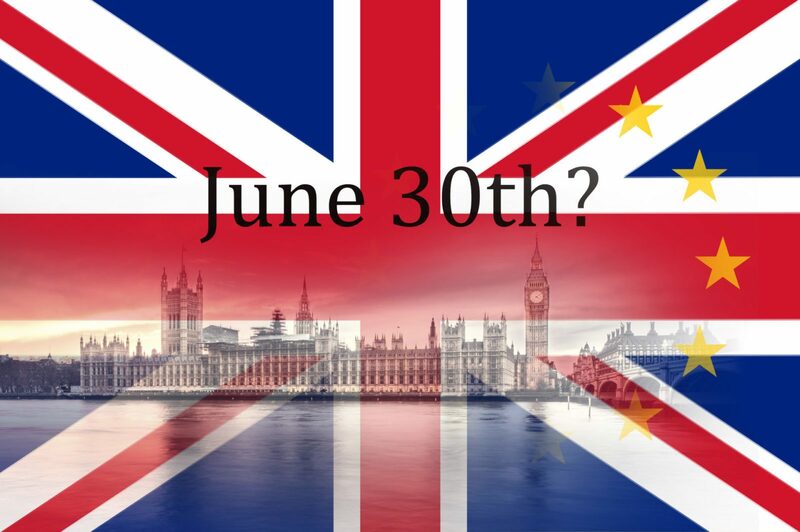 The move comes as Parliament narrowly voted to avoid a no-deal – but it will still be up to the European Union to accept the extension, and there will be difficulties around the European elections. It’s been a quiet day for the Eurozone, although the ECB meeting notes yesterday confirmed that rate hikes have been pushed back until 2020 at the earliest. In the US, the dollar edged higher as jobless claims fell to a multi-decade low. It’s not too late to protect your money against volatility – speak to your Business Trader today on 020 7898 0500 about how to use a forward contract to lock in the same exchange rate for up to two years. Before making some gains this morning, the pound broke its three day rising streak yesterday afternoon as concerns of a long extension to Brexit increased. Prime Minister Theresa May has said a further postponement to the Brexit date is needed if the UK is to avoid leaving the EU without a deal, and it is understood that she has written to Donald Tusk this morning to request an extension until the 30th of June. A withdrawal deal still hasn’t been approved by MPs, and cross-party talks continue today in the hope of breaking the Brexit deadlock. On Wednesday, a bill to force Theresa May to ask the EU for an extension was passed by one vote. If passed by the House of Lords also, the bill will allow MPs to decide on the length of a Brexit extension. The House of Lords will consider the draft legislation on Monday. Today, President of the EU Parliament, Donald Tusk, has suggested that a ’12 month flexible delay’ may be the answer, although this will have to be approved by EU leaders in their summit next week. The euro strengthened last night on the likelihood of a long extension to Brexit. Donald Tusk suggested that the best option could be a ‘flexible extension’ of up to a year, while Theresa May has just written to the EU to ask for an extension until 30th June. Yesterday, we had the notes from the ECB’s monetary policy meeting, as which the timing of a first rate hike has been pushed out to at least 2020. German industrial orders also hit their sharpest fall for two years, as foreign demand slowed. Today is a quiet day for releases, although Spanish consumer confidence is expected to come out four points lower than February. The dollar edged higher yesterday as US jobless claims fell to a multi-decade low, providing optimism for Non-Farm payroll data which will be released later today. The data is expected to show that 180K new jobs have been created in March. The dollar also made gains due to mixed hawkish remarks from the Federal Reserve. Federal Reserve Bank of Philadelphia President Patrick Harker said he sees “at most” one rate hike in 2019 and one in 2020. Federal Reserve Bank of Cleveland President Loretta Mester, meanwhile, hinted at the possibility of higher rates should the economy pick up momentum. This morning, the dollar was flat against most major currencies. In US-China Trade deal news, talks resumed in Washington yesterday. Despite positivity surrounding the talks, a date has not yet been announced for a trade summit between President Trump and President Xi Jinping. However, they do appear to be in the final stages of the talks now, as Trump administration officials have cited progress on several difficult issues.